Three bedroom end of terrace family home with parking to the front, detached garage and enclosed rear garden. With gas central heating and double glazing throughout. THE AREA The historic town of Skipton provides comprehensive shopping and leisure facilities together with excellent primary and secondary schooling, including two grammar schools which are consistently in the top three positions in the North Yorkshire performance league tables. Within 10 minutes drive of the Yorkshire Dales National Park, the town is close to the popular holiday destinations of Malham, Grassington and Bolton Abbey. The town’s railway station has regular services to Leeds and Bradford and a daily service direct to London. 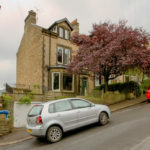 The major towns of East Lancashire and West Yorkshire are all within easy commutable distance. DESCRIPTION A well presented three bedroom property with gas central heating and upvc double glazed windows and doors throughout. Externally there is space to the front of the property providing parking for two cars, an additional paved drive down the side of the house leading to a detached single garage and enclosed rear garden. ENTRANCE HALL uPVC double glazed entrance door leads into the entrance hall, with door to the living room and stairs up to the first floor. LIVING ROOM 15′ 0" x 10′ 9" (4.57m x 3.28m) Good sized room with impressive handmade timber mantel and surround and green log burning stove with stone hearth. Ceiling coving and door leading into the dining room. KITCHEN 9′ 9" x 8′ 9" (2.97m x 2.67m) Comprising a range of handmade solid wood units with contrasting timber work surfaces over. An attractive Belfast sink with drainer. Space and plumbing for dishwasher. Stainless steel five ring Baumatic range cooker with double oven and stainless steel splashback and extractor hood over. Folding door leads to a rear entrance lobby with external upvc leading to the side of the house. FIRST FLOOR LANDING Stairs from the entrance lobby lead up to the first floor landing, with doors leading to all three bedrooms and the bathroom. Over stairs storage cupboard. MASTER BEDROOM 12′ 5" x 11′ 9" (3.78m x 3.58m) Good size double bedroom with laminate floor covering and window overlooking the rear garden. BEDROOM TWO 9′ 1" x 8′ 5" (2.77m x 2.57m) Double bedroom overlooking the garden with hatch to loft which is part boarded. BATHROOM Three piece white bathroom suite comprising bath with electric ‘Mira Go’ shower over, pedestal wash hand basin and WC. Wall tiling, tile effect vinyl floor covering and chrome ladder style heated towel rail. OUTSIDE To the front of the property there is a block paved area providing parking for two cars, which continues down the side of the house to a DETACHED SINGLE GARAGE with light, power and water supply. To the rear of the house there is an enclosed lawned garden with timber decking and fencing around. SERVICES We have not been able to test the equipment, services or installations in the property (including heating and hot water systems) and recommend that prospective purchasers arrange for a qualified person to check the relevant installations before entering into any commitment. AGENTS NOTE AND DISCLAIMER These details do not form part of an offer or contract. They are intended to give a fair description of the property, but neither the vendor nor Carling Jones accept responsibility for any errors it may contain. Purchasers or prospective tenants should satisfy themselves by inspecting the property. We have not been able to test the equipment, services or installations in the property (including heating and hot water systems) and recommend that prospective purchasers arrange for a qualified person to check the relevant installations before entering into any commitment.